"This new book is an updated version of the Hebrew original, published in 1998. The text contains a wealth of information on the climate of Israel. Over 700 papers and other research works (a small part of them in Hebrew but the majority in English) are cited in the text...the book is designed to serve the professional reader and as such it is the most comprehensive, updated summary of research and an excellent source of reference on many aspects of Israel's climate and related topics. The author carried out extensive work of integration and synthesis of the material into a solid text, achieving the delicate balance between the need for including and discussing large amounts of available material and the necessity to integrate it into a smoothly flowing text. The book contains a vast amount of information presented in a clear logical sequence. As such it will be of great benefit to both the beginner and experienced scientists who seek knowledge on almost every aspect of the climate of Israel. Professor Goldreich should be congratulated for producing such a scholarly, comprehensive volume. This book deserves to be in the library of every researcher and student in the field, as well as in every university library." 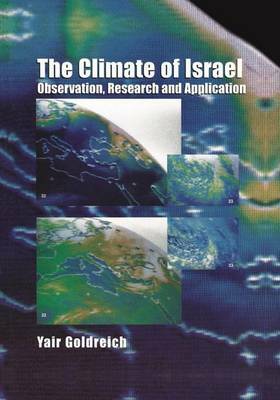 "...provides a good overview of the conceptual frameworks of the progress made in climate sciences in Israel. [...]...for somewhat experienced scholars, as well as advanced students, the book may be a valuable source of detailed knowledge, information and reference. overall, merit should be given to the author for his pioneering effort in publishing here for the first time in English the essential results of recent studies which reflect the progress made in climate sciences in Israel." "To summarize, Goldreich has a rich experience in statistical climatology and urban climate, and it definitely shows in this new book. The book contains a vast amount of information presented in a clear logical sequence. As such it will be of great benefit to both the beginner and experierenced scientists who seek knowledge on almost every aspect of the climate of Israel. Professor Goldreich should be congratulated for producing such a scholarly, comprehensive volume. This book deserves to be in the library of every researcher and student in the field, as well as in every university library."